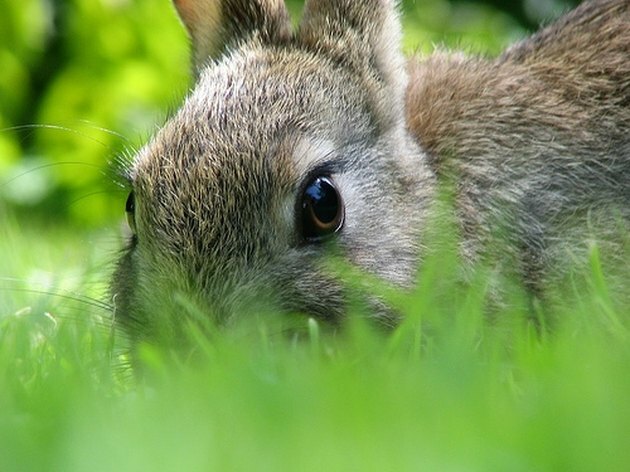 Rabbits can be pests in gardens of all types. Not only do they munch on vegetables, but they also eat bark, branches, needles, delicate plants and flowers. Rabbits can cause extensive damage to a backyard paradise; finding an effective rabbit repellent can also be a difficult task. In order to keep rabbits away from garden plants without causing them too much harm, cayenne pepper can be an effective deterrent to keep plants, shrubs, trees and vegetables undisturbed. Rabbits are cute but can be dangerous to your garden. Although ground cayenne pepper can be bought at most grocery stores, it can also cost more at those locations. Instead, purchase a large shaker of ground cayenne pepper from a warehouse club or look for smaller bottles at a dollar store. Shake the cayenne around the perimeter of the plants you want to protect, taking care to keep pepper off of delicate leaves and blooms. The idea is to catch the rabbit before he's chomping on the greens and flowers. Be sure to add cayenne again after each rain. Mix 2 cups f water, 1/4 cup of ground cayenne pepper, 1 tsp. of liquid dish-washing soap and one egg white for about a minute in blender until thoroughly mixed. Strain the mixture through cheesecloth before placing it in a garden sprayer to avoid clogging. Allow the mixture to sit for 12 hours, and then use all of it. Empty the sprayer and rinse well when you're finished. The spray will need to be reapplied each time it rains. Don't use cayenne pepper in a yard with young children because they may get the pepper on their skin or in their eyes. Dogs will also stay away from areas sprinkled with cayenne pepper or spray; be aware, however, that your dog may become ill if it gets too close to the pepper. The pepper will irritate the eyes, noses and mouths of pets. Will Deer Eat Tomato Plants?